As we celebrate Women’s History Month, we reflect on our relationships with organizations like the Iowa Women’s Foundation (IWF) that share our commitment to helping people—particularly women and girls—find success. 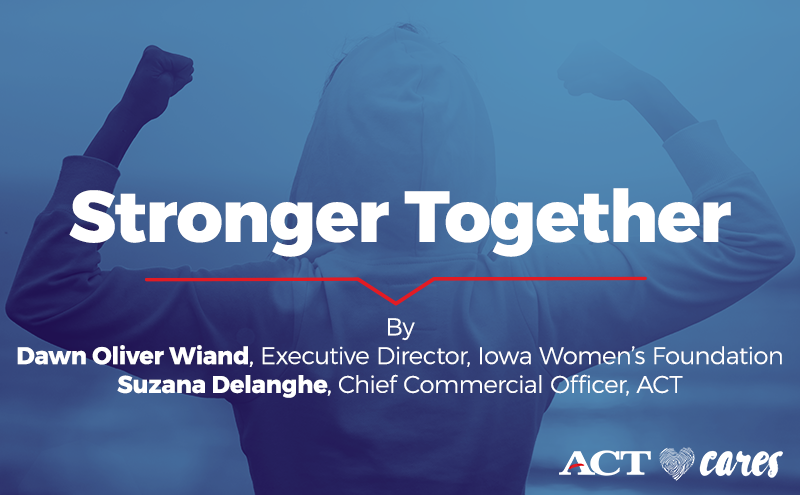 Learn a little about our work with IWF from Executive Director, Dawn Oliver Wiand, and ACT Chief Commercial Officer, Suzana Delanghe. Get inspired to support your community by being a role model for girls and women in your field and learn why both women are championing the talent and values women bring to society. How have ACT and IWF worked together in the past? Dawn: IWF is a statewide nonprofit that works to improve the lives of Iowa's women and girls through economic self-sufficiency. We are completely supported by charitable gifts from individuals, corporations and foundations. We are honored to have had ACT's financial support since 2014. In addition to the financial support, IWF has been the beneficiary of ACT team members’ time and expertise as volunteers. In addition, we have presented to ACT's team members with Women Leading Change to talk about empowering women in the workforce. Why is it important for organizations like ACT to work with IWF? Dawn: When a company supports community organizations, it is good for the organization, community and business. Employees are proud to work for a company that makes a difference and communities respect and like companies that are giving back. Suzana: As a major employer in Iowa City, dedicated to education and workplace success, ACT cares deeply about the economic self-sufficiency of Iowa women, and about helping Iowa’s women and girls along their journey to a fulfilling career. Several of our team members volunteer their time and expertise to support IWF’s mission, because it dovetails with ACT’s desire to support the community we call home. What was it like being an Ovation tribute? What did you learn about IWF? Suzana: I was proud that IWF recognized how important it is for me to empower women in the workplace and provide means for young women to succeed in their academic and professional lives. I like the fact that IWF, like ACT, is a research-based organization, using empirical research data to improve social mobility. What should people know about IWF? Dawn: IWF is the only statewide organization working to improve the lives of Iowa's women and girls through economic self-sufficiency. We believe when women are successful, their families are successful, and ultimately their communities. Dawn: Women's History Month is an opportunity for all of us to remember the difference women have made for each other over the years. From the right to vote, to equality in the work place, we need to support each other and work together. We are stronger together! Suzana: Women’s role and contribution to the workforce and society has always been significant, but has gained traction as late as in the ‘70s, when women could eventually access universities and get the same jobs as men, even if at a lower wage. I think it’s important to know the story of last century's “pioneers”—the battles they had to fight and their hard-won contributions—to inspire new generations to build a world that acknowledges the talent and value women bring to society. Through education and financial independence, women now can choose the life they want to live. What advice do you have for other women in your field? Dawn: Be supportive of each other. Be a mentor and encourage women and girls to dream big, reach for their goals and be confident in who they are and want they can do. Again, we are stronger together! Suzana: Be true to yourself, have the confidence to speak up about the issues that are important to you, and choose a career that is meaningful to your values and not only tied to financial gains.